Gross Area: 70,856 sq. ft.
Area Per Student: 21 sq. 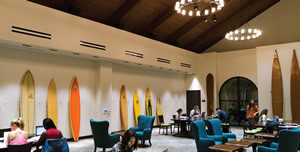 ft.
Payson Library is the cornerstone of Pepperdine University’s student learning community. Built over forty years ago, Payson Library was one of the last buildings on Pepperdine’s Malibu campus with original building systems, and it required modernization of its physical spaces and infrastructure to remain the “heart of the institution.” The recently completed renovation project imagined a twenty-first century learning-living environment, with a more intuitive and progressive user- friendly educational and social experience, and delivered a destination far exceeding the expectations of the university community, setting the standard for space development on our campus. The crowding out of readers by reading material is said to be one of the most common (and least desirable) characteristics of library space planning. More so now than at any other time, it is no longer enough for a library to be simply a book repository. Our project reflected this reality. Focusing on the foundation of digital research and the transformational trend of library spaces and new student uses, the University updated the interior design of the library to emphasize openness and encourage collaboration. To this end, we reduced the number of on-site books by half, removed interior walls and focused on broadening the entryway, utilized glass walls to capture natural light, and created intimate learning environments throughout the vast re-designed space. Among a long list of creative enhancements, the library now includes expanded and varied types of study areas (soft seating, historic library tables, a learning commons, individual study carrels, and triple the number of study rooms—from 8 to 26), powered furniture, upgrades to the library’s special collections and archives spaces, a centralized student success center for academic assistance, a maker lab, event and classroom spaces, fireplaces and patio fire pits, and a fully licensed Starbucks store. The University made minor adjustments to the front-facing exterior of the library as well, bringing it more in line with the institution’s architectural touchstone—a modern interpretation of the Mediterranean, and specifically Spanish Revival styles. This was accomplished by reducing some rectilinear hard lines in favor of rounded arches, and adding dark wood accents - a style more consistent with the surrounding central campus. By capturing the warm lighting from the interior spaces, and removing cement structures previously obscuring the view from floor to ceiling windows, the building now embraces its position in the surrounding courtyard and fully takes advantage of the gorgeous ocean views. Pepperdine has shown interest in housing a Starbucks coffee shop on our campus for nearly a decade, and with this renovation, the University accomplished this goal, in partnership with our dining services team from Sodexo, to the great delight of our campus community. The store is accessible both from inside the library and from the outdoor patio, and it is the first of its kind to have outdoor fire pits. This represents innovation and another acknowledgement of the changing ways in which students study and enjoy the company of others. Significant enhancements to the side patio leading out and around the building from Starbucks have drawn the library into the central heart of campus and created a community gathering space which spills from inside the library, through and including the patio, and out into the central campus plaza. The patio flooring is one of the great conversation pieces of the project—it looks like wood, but it is actually concrete. The university’s design team located a company pioneering a proprietary method to pour and shape integral and stained concrete to look like plank wood, and it was installed with great success. The project also upgraded and replaced the mechanical, electrical, plumbing, security, and fire/life safety systems, as well as made other facility improvements to meet the current code. The University re-wired the entire building to boost wireless and internet capabilities, re-roofed the entire structure, and installed an expandable chiller system that will one day help drive heating and cooling across the central campus in a much more efficient manner than with individual building units. Additionally, our design and construction team determined a way to engineer the building mechanical system to handle the unique and segregated needs of the archival cold storage, without installing a separate mechanical system. From economic and sustainable standpoints, this was a significant accomplishment. We installed gas fireplaces inside and the aforementioned gas fire pits on the outside patio. To create accountability for usage and conserve resources, we incorporated the controls for both heating elements into the building energy management and access control systems. Students, faculty, and staff use their ID card and individual PIN code to activate the fireplaces and fire pits, and a timer system limits to use with a maximum allowable setting. All lighting in the library is lamped with warm-colored LED bulbs, matching community preferences for illumination and university goals for energy conservation. Dimmable settings and incorporation into our energy management system are additional sustainable elements of the lighting package. The myriad of different fixtures, chandeliers, and lamps added an important depth to the project, in many cases perfectly setting off intimate areas and creating attractive views into the library through its many windows. Traditional bankers lamps adorn the historic tables, rounded iron chandeliers illuminate high-ceilinged spaces, and more modern fixtures draw your eye from the second story ceiling down through the curving staircase to the first floor. Ordinarily, mounting challenges force project managers to select hospitality lamps, severely limiting the choices in design. The University’s design team determined a way to anchor desired lamps to low bookcase shelving—this was particularly important because it allowed for the selection of desired candlestick table lamps, which created a unique and finished look, without compromising on the preference to have these lights mounted and non-movable. 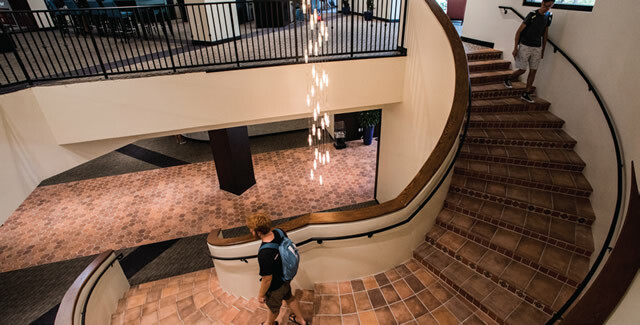 Because the University could achieve economies of scale and prevent unnecessary duplication of effort by concurrently completing work on a connected building, this project also incorporated renovations to the Huntsinger Academic Center (HAC). This work made possible the student success center—a collected area of academic advising formerly decentralized across the university. The library renovation also spurred a major innovative expansion for the University. Surge space and a way to continue library operations during construction were prominent challenges in the pre-construction planning phases of the project. After exploring expensive and highly impactful on-campus solutions, we began to consider off-campus surge space options. Our search uncovered a unique opportunity with great potential—a building 13 minutes from the campus that not only accommodated our near-term library surge space needs, but which also gave us the space needed to pursue our aspirational goal of relocating operational departments from the Malibu campus to open up space for academic growth. After securing a long-term lease on the 107,000 square foot building, the University moved a majority of the library books into the bottom floor space and instituted a highly effective request and delivery system with an established library hub in Malibu. We also created study space in the new building to supplement the interim study space options created on campus. We moved just over 100 non student - facing operational departments to the second floor of the building—opening up additional space in Malibu for temporary classrooms and eventually an expansion of academic operations. This project is unlike many other library transformations, which seek only to create very modern depictions of current thinking. It was designed with intentionality. Pepperdine is a place of foundation, and we celebrate our heritage. Yet, as an educational institution, we are also moving forward, peering into the future. So, we stand firm on our base, and we look forward with hope and opportunity. We honor those who brought us to this place where we now stand, even while we embrace the newness of the future. 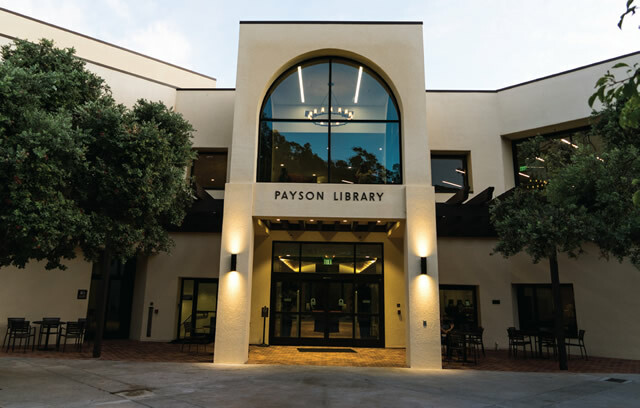 The Payson Library renovation represents this embrace of foundation and innovation. The darks woods against white plaster, the Spanish tiles and wrought iron railings harken back to a Spanish revival style which, through the confluence of different cultures, all affirmed that “God is” – just as we do. The glass, powered modular seating, maker lab, and the overall contemporary feel of the project urge us to look forward and endeavor toward the unknown. It would be difficult to accurately depict the influence the new library has had on the University community. 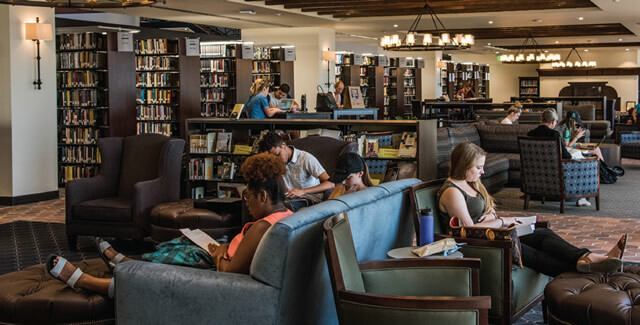 In addition to transforming the learning environment, the library has become the preferred gathering space for students, faculty, and staff at all hours of the day and night, and its use has absolutely skyrocketed. Perhaps its impact can be best captured this way: As the President was addressing the undergraduate students a week into the new fall semester, he was discussing many exciting things happening at the opening of the academic year. When he mentioned the newly re-opened library, the crowd broke into spontaneous applause. When was the last time 18-22 years old celebrated the opening of a library? Mission accomplished. Nice variety of spaces, each evoking a specific “feel.” I applaud their planning approach. I particularly like the patio and fire pit.